Turmeric, admittedly one of my most favorite herbs, is steadily becoming more and more popular here in the West. Whether used as a culinary spice or herbal medicine, this bright, beautiful creation of nature has a multitude of health benefits hidden within. So how do you incorporate Turmeric in your daily life? Easy! You can add it to any dish such as soups, rice, bean dishes, eggs, oatmeal, veggie sautés, casseroles and stews. To get a larger dose of it you can mix a little in some raw honey and take it 2-3 times daily. One of my personal favorite ways to get my daily dose of turmeric is a simple, yet delicious recipe known as Golden Milk. Click here for our Golden Milk recipe! 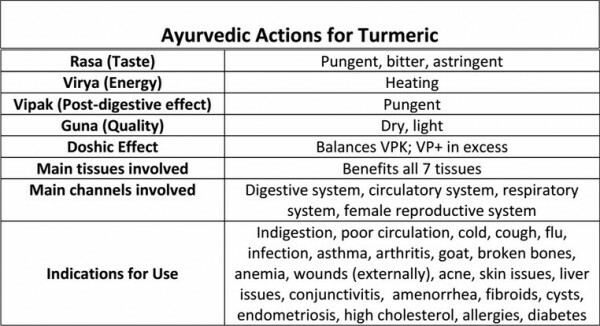 Discover more ways to get a daily dose of Turmeric in your diet here. 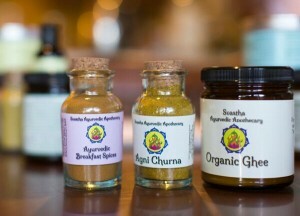 Take 1/4 tsp of turmeric, 1/4 tsp of neem and 1/4 tsp of amalaki, three times daily before meals. Mix with 1/4 cup of warm water and 1 Tbsp of aloe vera juice. *For more potent results, try our Love your Liver Tincture! *These herbs can be replaced with 1/2 tsp of our Daily Detox Formula. Instructions: Mix the herbs and aloe in the warm water. Steep for 5 minutes, stir and drink. Follow with warm water. Take this 2-3 times a day, before meals for at least 30 days. *For best results, take this tonic daily while externally using our Anti-Aging Skinfood and Ageless Triphala Face Mask! Mix 1/4 tsp of turmeric, 1/4 tsp of shardunika (aka gurmar) and 1/4 tsp of karella (aka bittermelon) in 1/2 cup of warm water. Take three times daily before meals. 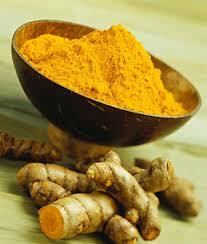 For prevention of Alzheimer’s, take 1/4-1/2 tsp of turmeric with 1/2 tsp of Majja Ghrita twice daily. Take once in the morning on an empty stomach and again around 2-3pm between meals. For treatment of Alzheimer’s, take an additional time (so three times daily), the last dosage being before bed.